When Rachel Masen took a trip to Kentucky for the Retired Racehorse Project's Thoroughbred Makeover event last October, she didn't know she'd be leaving with a request from a Kentucky breeder to help locate a horse back out west. A lifelong racing fan, Masen wanted to visit historic Calumet Farm on her trip. While taking a tour of the Lexington operation, she spoke with Calumet's Jak Knelman, whose family owns Farfellow Farms near Paris, Ky. As Masen was explaining her role as the California Retirement Management Account (CARMA) liaison at Golden Gate Fields, Knelmen mentioned a horse bred by Farfellow that ended up in Northern California. Knelman was keeping tabs on the filly as best he could, but he wanted to make sure that she ended up in a good home once her time on the track was over, so he asked Masen for help. Within days of being back in California, Masen located the filly—named Kellianne Can Can—and spoke to her then-trainer, Steve Howard, to let him know the breeder wanted to help make sure she had a safe place to land. "I exchanged the info between the two of them so they could get in touch, because Mr. Howard wasn't ready to stop on her yet," Masen said, adding that the Colonel John filly was in excellent condition when she first met her. "(Knelman and Howard) talked, and they agreed that if she didn't race well in the next race that they were going to retire her and I was going to help get her into an aftercare program. The race never went, she never raced. They took her out of training right away." With cooperation from everyone, and the decision made to retire the horse, Masen was able to get CARMA paperwork filled out quickly so Kellianne Can Can could move on. "From the time that I met Jak to the time the horse left the track in the trailer to go to the CARMA facility was a few days over a month—it was a very quick turnaround," Masen said. "It was pretty quick because everybody was really responsive and ready to make sure that the horse ended up in the right place. "Having interested owners and breeders who want to take the time to make sure their horses are going to be OK is something that I wish there was more of." 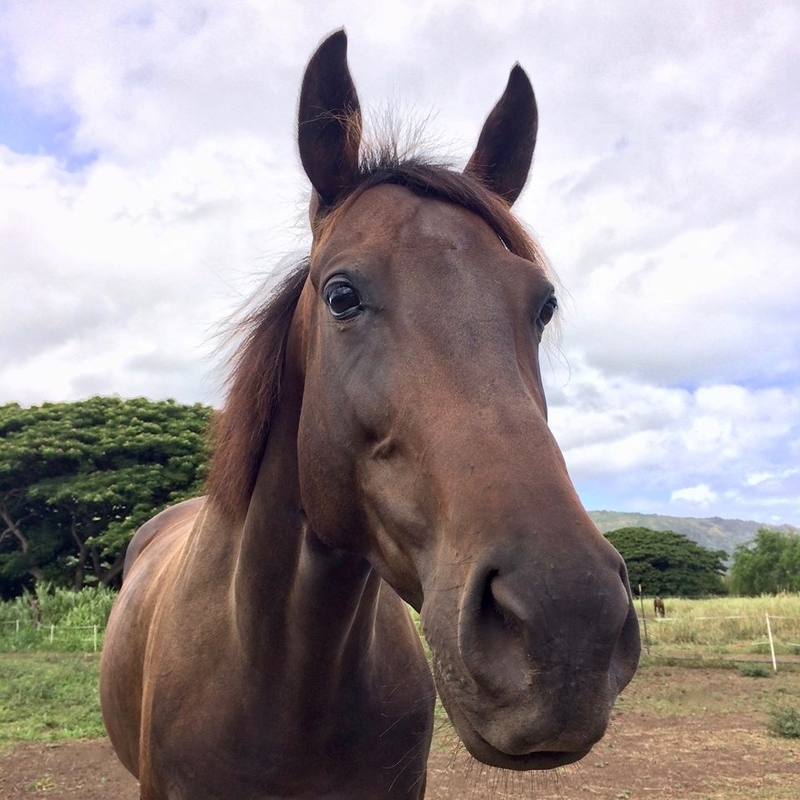 The filly spent a couple of weeks at a CARMA facility, then went to the Thoroughbred Aftercare Alliance-accredited Square Peg Foundation for some rehab and retraining before she was adopted out to Jessica Avila-Franco, a hunter/jumper rider who lives in Hawaii. "I probably never would have heard about the horse if I hadn't met Jak and he hasn't asked me for help," Masen said of Kellianne Can Can. Knelman was impressed by Masen's helpfulness and the fact that there is a dedicated person on track in place to help horses transition off the track. "She was able to facilitate (the horse) getting into the right hands. ... she was just great," Knelman said. "I've never thought a track would have that personnel there to do that. 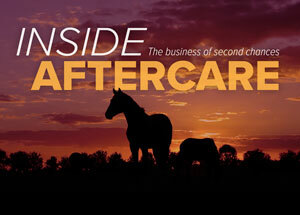 I think it's really great, because if you can trust an accredited person (for aftercare at a racetrack). ... you know that they are making sure that (horses) are going to the right places and they are following up with it." Kellianne Can Can is just one example of the 44 horses Masen has received a call on since starting her current position 19 months ago. From the time Masen has been involved in aftercare in the area, a few years prior to starting her current position, she says the market for off-track Thoroughbreds has changed for the better. "(The market has) definitely changed," she said. "There are things that have helped increase the market value of the animals and a lot of that is awareness from trainers and owners learning that they don't need to race these horses until they are broken." Masen said showcasing what the breed can do in other equestrian events, especially through the work of the Retired Racehorse Project, is helping increase Thoroughbreds' value in riding circles. So is CARMA's placement program, which takes horses off the track that need rehabbing or down time and places the horses in a layup facility before they are sent to an aftercare facility, second career, or permanent sanctuary. "(CARMA) are getting the horses into a place where they can start the retraining and get them adopted out sooner," Masen said. "Horses are moving faster. They are not staying the the aftercare programs as long, because CARMA is handling that."